Batata Bhaji is to an Indian what roasted potatoes is to an American. The potatoes are spiced to give it flavor. It is a vegetarian and a vegan recipe. In Goa there are a few variations one where curry leaf and cumin are the bold flavors, the other is ginger and cumin. 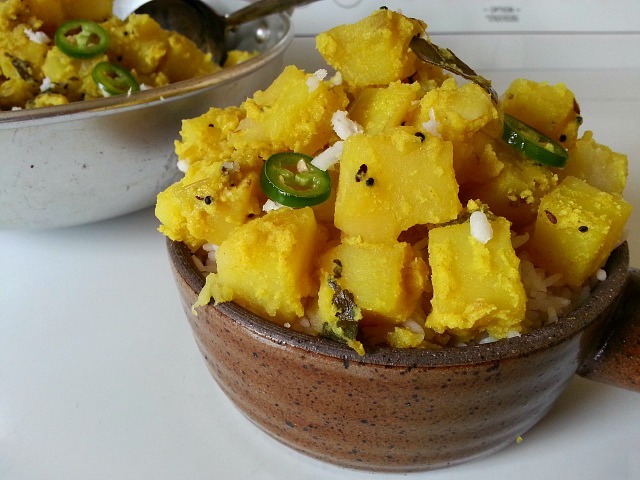 This potato recipe can be made with or without coconut also with gravy or dry. 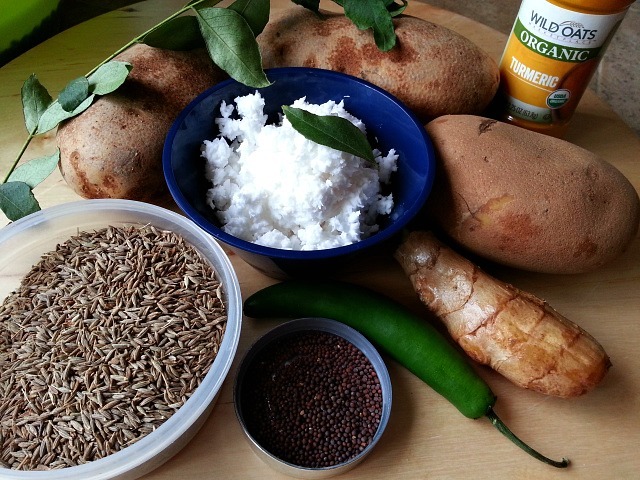 The dry version can be used to make a favorite Indian snack called Batata Vada. A deep-fried potato dumplings coated with a garbanzo bean flour batter. Interestingly “Batata” in portuguese is “Potato” and is a word used all over in India but there is a difference in the pronunciation and you can tell the difference if you are familiar with both. This recipe was made mostly on Fridays at our home. The leftovers are used to make kids popular grilled sandwich for snack. The bread is stuffed with potatoes and a little ketchup….yummy! You can also make potato fritters by mashing the potatoes, forming into patties and coating them with rava (cream of wheat) and shallow frying till golden brown. Wash, clean and cut the potatoes in 1/2″ cubes. Soak them in light salted water. Grind the coconut, ginger, 1/4 tsp of cumin with 1/3 cup water to a paste. Heat oil in a pot add the mustard seeds till it splutters, add the onions, cumin seeds, jalapeno and saute till the onion is translucent. Next add the turmeric, coconut paste, curry leaves and saute for 2-3 minutes. Add the remaining water, season with salt and cover till the gravy simmers. Finally add the potatoes, check on salt, cover and cook on medium low heat for 15-20 minutes till the potatoes are soft. Do not over stir lest the potato get mashed. Enjoy with hot rice, bread, puri (poori) or dosa. Long time ago I stayed in Goa and our guest house served “Goan potatoes” at breakfast. Is it a real thing? If yes, can you share the recipe with me? Thank you! The above recipe would be what they may have served. Every house hold may have a variation. It is either made dry or with gravy by adding water. Thank you for your answer. I’ll try this recipe this week! Thank you so much for liking my most recent post on my brand new blog! This is an awesome post….really cool/good looking foods Ive definitely never been exposed to here in New England! I think Ill be making a few of these recipes! You’re welcome. I quite liked this recipe and thought maybe others could view it.. It’s a fresh take on plain old potatoes. Love potato and other veggie curries! Sometimes in London we have to look for veggie places to get dishes like this. Sometimes the flavours aren’t right.. This is on point. Hope you put up more veggie and fish curries! Thank You Gina :-). It is indeed a great side dish. I nominated you for the Liebster Award. If you participate you can find it in my post of awards. For some reason my phone is messing up and can not add the link here. I’m sure you probably already have this one huh Nandini? Has anyone ever tried this spice on a vegetable other than potato? Like eggplant? Yes JoEllen, you can use similar spices with eggplant just add a tomato and reduce the quantity of water as eggplant lets out it’s own. That is if you do not want the eggplant to get too mushy. Batata Bhaji looks awesome Nandini. Loved those chilies on the top. Hi Nandini, Great recipe – just as I have duck fat/rosemary roast potatoes in the oven for sunday dinner. I”ll try this for my next Indian feast! Can’t wait to try these this week. Love the spices and the “heat” element of the dish. I’ll let you know how it goes over with the family. Wow, this one sounds like a perfect meal! I love potatoes and coconut! And the batter sounds mouth-watering! The finished dish looks delicious but I’ll bet the kids’ sandwich is a favorite. That sounds sooo good. We do a variation of this, but with pickled jalapeños – yours looks wonderful! Thank You Monique! You are right there are many variations to this recipe depending on the region. What a cool recipe ! Potatoes & Coconut yummi!!!! 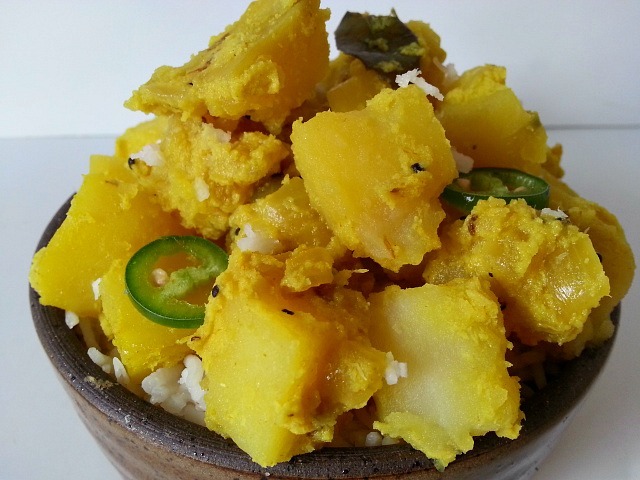 Hi Nandini, I love potatoes with curry spices, and this sounds really good! Next time i make an Indian curry, I’ll serve these as a side dish. – Say, I do a great Indonesian style potato dish you you will love! Let me know if you’re interested and I’ll post it for you. I could eat this every day and still not be bored. Very nice again Nandini, except I’m not sure I’ve tried it with the coconut? I make potato baji a lot, and this looks a bit like it with a few different spices though. Hey, I have nominated your amazing Blog for “The Real Neat Blog Award.” To learn more, please see the post about it on my blog. Thank you so much for the award Suz. It is very kind of you. I am humbled by it :-). Batata Bhaji looks extremely mind-blowing. Whenever I go to Goa, I go to Tato’s and Kamat’s and occasionally to Bombay cafe for Batata bhaji. It was very easy to go to this restaurants as My mum’s house is in Comba,Margao. I like batata bhaji with the puris. It really brings back very happy memories of Margao,Goa. Your recipes are stunning. I think this dish is more Indian than Goan. Correct Me if I’m wrong. Nevertheless Your recipes make My day. Thank You so much Mr Stan for your kinds words. It’s good to know you are from Margao as well. what a small world :-). You are right this recipe is more Indian then Goan……the addition of fresh coconut seals the deal for being Goan :-). You and Mrs Stan have a great weekend. In the UK we eat a lot of Indian food mostly influenced by the Bangladeshi communities here but I’ m loving your Goan regional recipes. Thank you! You are so welcome Janet. There is a large chunk of Goan population in Uk from Africa and Goa. I do have my mum’s family in Croydon and Kent. Just when one thought they’d had pretty much most types of potatoes along comes this most i teresting recipe to surprise and delight. Coconut with potatoes! Never in my wildest imagination. Isn’t that something Johanne :-). The ground coconut makes the gravy thicker and creamy. I really enjoy your recipes! Thanks to your blog, I have discovered a new place I hope to visit one day! Except for coconut, I have everything at home to try this. I guess I know what I am shopping for this weekend. Looks good, I’ll have to try them. I love your recipe and all of the ingredients you have included, I love shredded coconut. Nice picture with all of the ingredients layed out too. Those potatoes look delicious!!! I want to try this ! 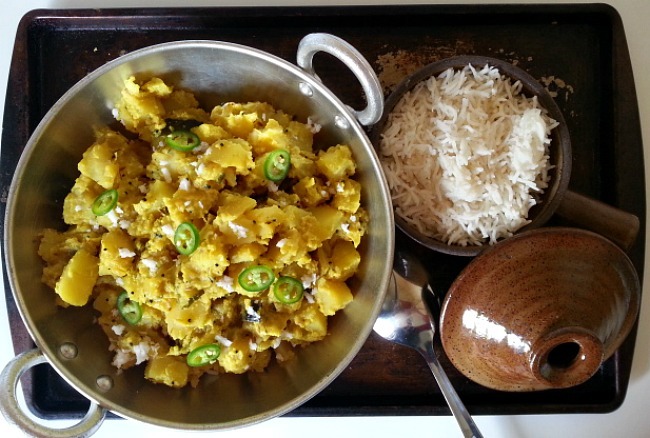 Had these delicious potatoes at an Indian restaurant yesterday – today I have the recipe! Thank You for the re-blog Jueesepi, appreciate it very much :-).